Notebooks at Netbook Prices: How Low Can We Go? It used to be that getting any laptop for under $1000 was virtually impossible unless you were willing to buy used. Since 2000, we've seen a huge surge in laptop sales along with an accompanying drop in prices. We've had new laptops starting at under $600 since around 2005, but a quick look at the specs of the laptops in that old article will show you just how far we've come in four short years. For those that don't want to follow the above link, here's a quick recap. Four years ago, $600 would buy you a single-core processor (Celeron M or Sempron) running at between 1.4GHz and 1.6GHz. Hard drives were usually of the 40GB 4200RPM or 5400RPM variety, paired with 24X CD-RW/4X DVD-ROM combo drives. And here's something that's amazing in today's market: many inexpensive notebooks failed to provide built-in WiFi support (though you could add it for a moderate $50 or so). The real kicker however is that all of those cheap laptops checked in with a paltry 256MB DDR-333 RAM. Ouch! Battery life ranged from just over two hours to around four hours, which is one area where things unfortunately haven't really improved much. What can you get in an entry-level notebook (not netbook!) these days? Best Buy and Wal-Mart have had $300 laptops in the news lately, though it appears both are "limited quantities/availability". Rather than restrict ourselves to short-term sales, we wanted to look at the specs of a few sub-$500 notebooks you can currently buy. We'll start with Wal-Mart's $300 offering as the baseline - it went on sale this past Sunday Morning (July 26) and likely sold out shortly thereafter. However, it's an in-store-only offering, so unless you run by your local Wal-Mart(s) there's no way to know for sure if it's available or not. This is not a powerhouse laptop by any stretch of the imagination, but if you want something that can run circles around a netbook and prefer a larger keyboard and screen (and lower battery life and increased weight) then this Compaq Presario has a lot going for it. The Sempron SI-42 is a single-core 65nm processor with 512KB L2 running at 2.1GHz - it should be rather similar in performance to the old Athlon 64 3500+, which should be about twice the speed of the Intel Atom N280 give or take. [Ed: Note that the link compares a dual-core 1.60GHz Atom with a single-core Pentium 4 3.6GHz - and the P4 660 ends up being about 65% faster on average; twice as fast is a conservative estimate!] For web surfing, office work, email, and other basic school needs such a CPU is more than "fast enough". Graphics are provided by NVIDIA's GeForce 8200M, which should handle even HD video playback. Perhaps one of the best aspects of this notebook is that it comes with 3GB of DDR2-800 memory. Compaq ships the unit with Windows Vista Home Basic, which is naturally a 32-bit version. There's not much sense in getting a 64-bit version of Home Basic (why get a stripped down, 64-bit OS? ), and while we could grumble a bit about not getting 4GB RAM for a few dollars more, without a 64-bit OS it really doesn't matter. Also keep in mind that Windows Home Basic is not eligible for Windows 7 upgrades (this applies to all the laptops in this article shipping with Home Basic). Rounding out the package you get a 160GB hard drive, DVDRW, and 802.11G networking. Battery life with the 6-cell battery is "up to four hours", though we suspect three hours will be more likely under light usage. The LCD quality on virtually all sub-$500 laptops/notebooks is going to be questionable at best, but it's doubtful anyone in the market for such a computer will notice. 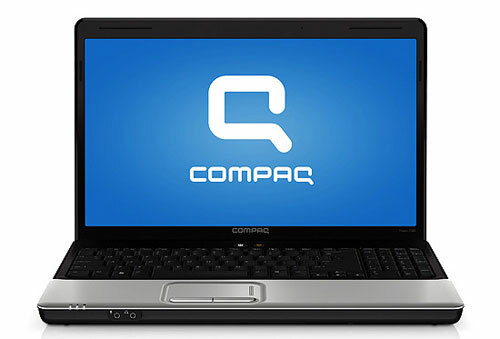 This is a great laptop for the price - as a point of reference, the Compaq 15.6" CQ60-410US is very similar in overall specs (slightly lower in some areas and higher in others) and retails for $448. Of course, it's not a limited availability laptop. Assuming you can find the CQ60-419WM in stock, the real question is whether you like the lightweight netbooks with improved battery life or you prefer a larger display, keyboard, and laptop with better performance. You get what you pay for, and in this case it's a very reasonable trade if you're not a demanding computer user. We can say the same about many other laptops, so let's look at a few of the alternatives that are available online and in stores. We searched Best Buy, Wal-Mart, and a few other websites looking for laptops that sell for rock-bottom prices while still providing all of the necessary features. We tried to avoid any limited time offers, which means prices are going to be higher than $300, but you should be able to find similar laptops at a variety of retailers. Here's what we found. Please, do yourself a favor and never order anything from TigerDirect. I regret the day that I ordered something from them, because I've been deluged with spam ever since. It was the most expensive $5 savings ever. I dont know if either of them is in stock, but Best Buy has two really cheap laptops listed in their ad this week. 1. For 299.00 they list a Toshiba single core celeron, 2gb ram and Vista Basic. 2. For 399.00 they list a Dell dual core pentium, 4gb of ram, and Vista premium. I meant in real life applications that support multi-threaded tasks, otherwise for single-threaded applications the Athlon 64 3500+ should be nearly always faster than 2X. I meant in real life applications that support multi-threaded tasks, otherwise for single-threaded applications the 2,2Ghz Pentium4(A) should be nearly always faster. So I think that the labeling of "2X faster" of Athlon 64 3500+ in real life applications is better characterization.